I apologise for the pretty naff photo, I only just noticed how out of focus the background is. My Bad. Maybe just concentrate on the little guy, he's Monster Love from Little Miss Muffet. That's all from me today folks. I have quite a few posts coming up this week and I want to try and get ahead instead of flying by the seat of my pants. Have a great day. This is adorable Faye! I love the rainbows and your colouring is fab! Great colour combo! Fabby card Faye - love that little monster and the way you have coloured him. That backing paper is rather gorgeous too. This is fabulous Faye, I like the image and the wonderful background you have created. After a few glasses of wine the whole card looks a bit hazy but from I can see from my good I it looks well? Good,!! How cute is this little guy - I think he is next on my list - love the bg and the coloring is great. 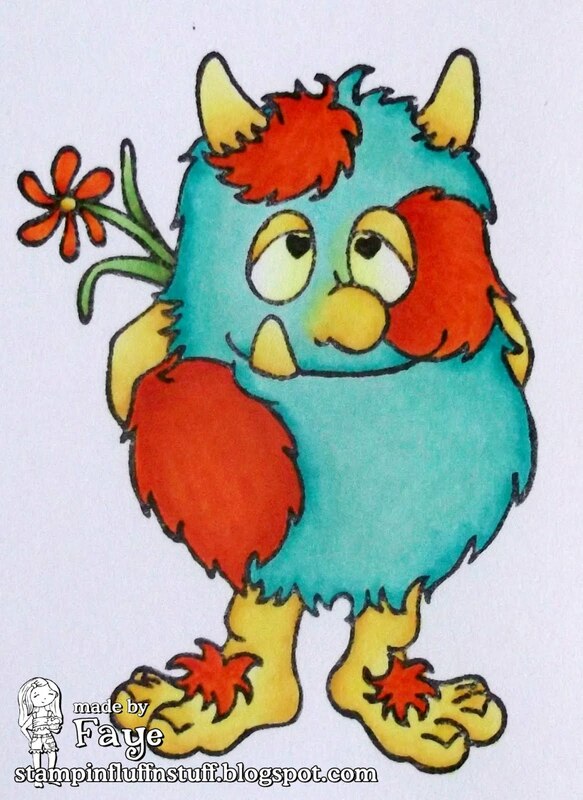 Great colouring of that cute guy, Fluffie....great background too! Love how you colord him!! It's hot here and I mean really hot,everything sticks on my sweaty hands,so not a lot of crafting for me and I have a lot to post this week to!!! Flying pants? Now this i must see. I love your little scene, Faye - just adorable! Faye, your little scene is adorable! Love those clouds and of course the little guy too! Nice to hear someones seen the sun, it only peaked out behind the clouds here for a few seconds. 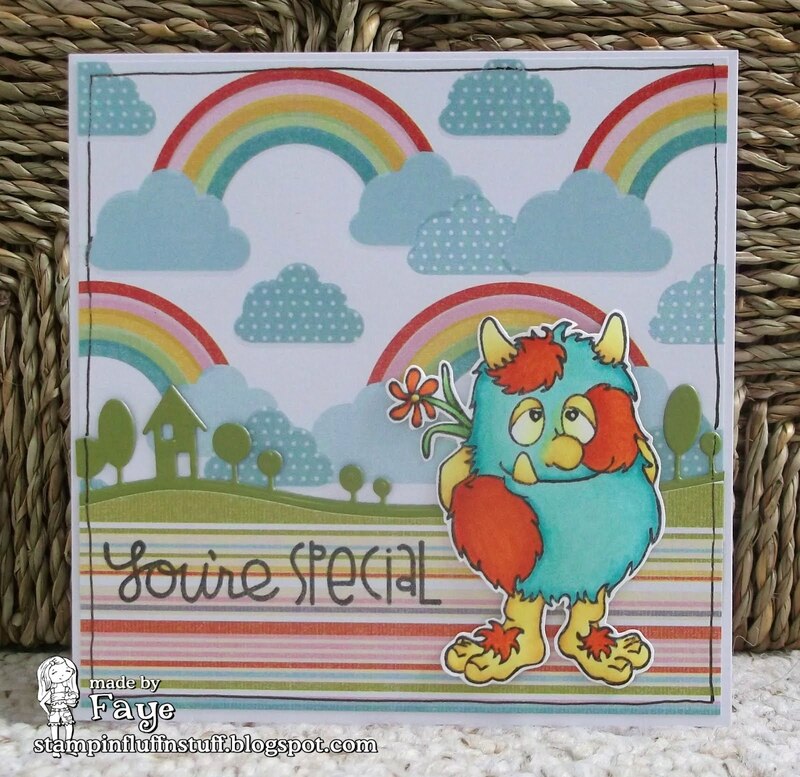 Love this little monster card, so bright and cheery! Soooo cute Faye...I love him..! Gorgeous card here sweetie fab image & love the colours. Wowzer...just love how you've done the rainbows and clouds!! Thanks for joining our animal theme challenge over at A Gem of a Challenge - good luck!